A hard disk drive (HDD), hard disk, hard drive or fixed disk[lower-alpha 2] is a data storage device used for storing and retrieving digital information using one or more rigid rapidly rotating disks (platters) coated with magnetic material. The platters are paired with magnetic heads arranged on a moving actuator arm, which read and write data to the platter surfaces. Data is accessed in a random-access manner, meaning that individual blocks of data can be stored or retrieved in any order and not only sequentially. HDDs are a type of non-volatile memory, retaining stored data even when powered off. Introduced by IBM in 1956, HDDs became the dominant secondary storage device for general-purpose computers by the early 1960s. Continuously improved, HDDs have maintained this position into the modern era of servers and personal computers. More than 200 companies have produced HDDs historically, though after extensive industry consolidation most current units are manufactured by Seagate, Toshiba, and Western Digital. As of 2016, HDD production (in bytes per year) is growing, although unit shipments and sales revenues are declining. The primary competing technology for secondary storage is flash memory in the form of solid-state drives (SSDs), which have higher data-transfer rates, higher areal storage density, better reliability, and much lower latency and access times. While SSDs have higher cost per bit, SSDs are replacing HDDs where speed, power consumption, small size, and durability are important. The primary characteristics of an HDD are its capacity and performance. Capacity is specified in unit prefixes corresponding to powers of 1000: a 1-terabyte (TB) drive has a capacity of 1,000 gigabytes (GB; where 1 gigabyte = 1 billion bytes). Typically, some of an HDD's capacity is unavailable to the user because it is used by the file system and the computer operating system, and possibly inbuilt redundancy for error correction and recovery. Performance is specified by the time required to move the heads to a track or cylinder (average access time) plus the time it takes for the desired sector to move under the head (average latency, which is a function of the physical rotational speed in revolutions per minute), and finally the speed at which the data is transmitted (data rate). Hard disk drives were introduced in 1956, as data storage for an IBM real-time transaction processing computer and were developed for use with general-purpose mainframe and minicomputers. The first IBM drive, the 350 RAMAC, was approximately the size of two medium-sized refrigerators and stored five million six-bit characters (3.75 megabytes) on a stack of 50 disks. The IBM 350 RAMAC disk storage unit was superseded by the IBM 1301 disk storage unit, which consisted of 50 platters, each about 1/8-inch thick and 24 inches in diameter. Whereas the IBM 350 used two read/write heads, pneumatically actuated and moving through two dimensions, the 1301 was one of the first disk storage units to use an array of heads, one per platter, moving as a single unit. Cylinder-mode read/write operations were supported, while the heads flew about 250 micro-inches above the platter surface. Motion of the head array depended upon a binary adder system of hydraulic actuators which assured repeatable positioning. The 1301 cabinet was about the size of three home refrigerators placed side by side, storing the equivalent of about 21 million eight-bit bytes. Access time was about 200 milliseconds. In 1962, IBM introduced the model 1311 disk drive, which was about the size of a washing machine and stored two million characters on a removable disk pack. Users could buy additional packs and interchange them as needed, much like reels of magnetic tape. Later models of removable pack drives, from IBM and others, became the norm in most computer installations and reached capacities of 300 megabytes by the early 1980s. Non-removable HDDs were called "fixed disk" drives. 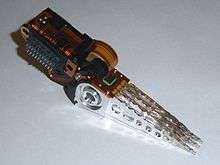 Some high-performance HDDs were manufactured with one head per track (e.g. IBM 2305) so that no time was lost physically moving the heads to a track. Known as fixed-head or head-per-track disk drives they were very expensive and are no longer in production. In 1973, IBM introduced a new type of HDD codenamed "Winchester". Its primary distinguishing feature was that the disk heads were not withdrawn completely from the stack of disk platters when the drive was powered down. Instead, the heads were allowed to "land" on a special area of the disk surface upon spin-down, "taking off" again when the disk was later powered on. This greatly reduced the cost of the head actuator mechanism, but precluded removing just the disks from the drive as was done with the disk packs of the day. Instead, the first models of "Winchester technology" drives featured a removable disk module, which included both the disk pack and the head assembly, leaving the actuator motor in the drive upon removal. Later "Winchester" drives abandoned the removable media concept and returned to non-removable platters. Most HDDs in the early 1980s, were sold to PC end users as an external, add-on subsystem. The subsystem was not sold under the drive manufacturer's name but under the subsystem manufacturer's name such as Corvus Systems and Tallgrass Technologies, or under the PC system manufacturer's name such as the Apple ProFile. The IBM PC/XT in 1983 included an internal 10 MB HDD, and soon thereafter internal HDDs proliferated on personal computers. Driven by ever increasing areal density since their invention, HDDs have continuously improved their characteristics; a few highlights are listed in the table above. At the same time, market application expanded from mainframe computers of the late 1950s to most mass storage applications including computers and consumer applications such as storage of entertainment content. A modern HDD records data by magnetizing a thin film of ferromagnetic material[lower-alpha 6] on a disk. Sequential changes in the direction of magnetization represent binary data bits. The data is read from the disk by detecting the transitions in magnetization. User data is encoded using an encoding scheme, such as run-length limited encoding,[lower-alpha 7] which determines how the data is represented by the magnetic transitions. A typical HDD design consists of a spindle that holds flat circular disks, also called platters, which hold the recorded data. The platters are made from a non-magnetic material, usually aluminum alloy, glass, or ceramic, and are coated with a shallow layer of magnetic material typically 10–20 nm in depth, with an outer layer of carbon for protection. For reference, a standard piece of copy paper is 0.07–0.18 millimeters (70,000–180,000 nm). In modern drives, there is one head for each magnetic platter surface on the spindle, mounted on a common arm. An actuator arm (or access arm) moves the heads on an arc (roughly radially) across the platters as they spin, allowing each head to access almost the entire surface of the platter as it spins. The arm is moved using a voice coil actuator or in some older designs a stepper motor. Early hard disk drives wrote data at some constant bits per second, resulting in all tracks having the same amount of data per track but modern drives (since the 1990s) use zone bit recording—increasing the write speed from inner to outer zone and thereby storing more data per track in the outer zones. In modern drives, the small size of the magnetic regions creates the danger that their magnetic state might be lost because of thermal effects, thermally induced magnetic instability which is commonly known as the "superparamagnetic limit". To counter this, the platters are coated with two parallel magnetic layers, separated by a 3-atom layer of the non-magnetic element ruthenium, and the two layers are magnetized in opposite orientation, thus reinforcing each other. Another technology used to overcome thermal effects to allow greater recording densities is perpendicular recording, first shipped in 2005, and as of 2007 the technology was used in many HDDs. In 2004, a new concept was introduced to allow further increase of the data density in magnetic recording, using recording media consisting of coupled soft and hard magnetic layers. 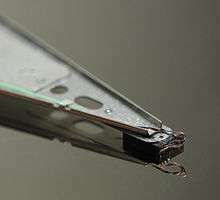 That so-called exchange spring media, also known as exchange coupled composite media, allows good writability due to the write-assist nature of the soft layer. However, the thermal stability is determined only by the hardest layer and not influenced by the soft layer. The voice coil itself is shaped rather like an arrowhead, and made of doubly coated copper magnet wire. The inner layer is insulation, and the outer is thermoplastic, which bonds the coil together after it is wound on a form, making it self-supporting. The portions of the coil along the two sides of the arrowhead (which point to the actuator bearing center) interact with the magnetic field, developing a tangential force that rotates the actuator. Current flowing radially outward along one side of the arrowhead and radially inward on the other produces the tangential force. If the magnetic field were uniform, each side would generate opposing forces that would cancel each other out. Therefore, the surface of the magnet is half north pole and half south pole, with the radial dividing line in the middle, causing the two sides of the coil to see opposite magnetic fields and produce forces that add instead of canceling. Currents along the top and bottom of the coil produce radial forces that do not rotate the head. In the newest drives, as of 2009, low-density parity-check codes (LDPC) were supplanting Reed-Solomon; LDPC codes enable performance close to the Shannon Limit and thus provide the highest storage density available. Typical hard disk drives attempt to "remap" the data in a physical sector that is failing to a spare physical sector provided by the drive's "spare sector pool" (also called "reserve pool"), while relying on the ECC to recover stored data while the amount of errors in a bad sector is still low enough. The S.M.A.R.T (Self-Monitoring, Analysis and Reporting Technology) feature counts the total number of errors in the entire HDD fixed by ECC (although not on all hard drives as the related S.M.A.R.T attributes "Hardware ECC Recovered" and "Soft ECC Correction" are not consistently supported), and the total number of performed sector remappings, as the occurrence of many such errors may predict an HDD failure. Only a tiny fraction of the detected errors ends up as not correctable. For example, specification for an enterprise SAS disk (a model from 2013) estimates this fraction to be one uncorrected error in every 1016 bits, and another SAS enterprise disk from 2013 specifies similar error rates. Another modern (as of 2013) enterprise SATA disk specifies an error rate of less than 10 non-recoverable read errors in every 1016 bits. An enterprise disk with a Fibre Channel interface, which uses 520 byte sectors to support the Data Integrity Field standard to combat data corruption, specifies similar error rates in 2005. The worst type of errors are those that go unnoticed, and are not even detected by the disk firmware or the host operating system. These errors are known as silent data corruption, some of which may be caused by hard disk drive malfunctions. The rate of areal density advancement was similar to Moore's law (doubling every two years) through 2010: 60% per year during 1988–1996, 100% during 1996–2003 and 30% during 2003–2010. Gordon Moore (1997) called the increase "flabbergasting," while observing later that growth cannot continue forever. Areal density advancement slowed to 10% per year during 2011–2014, due to difficulty in migrating from perpendicular recording to newer technologies. Areal density is the inverse of bit cell size, so an increase in areal density corresponds to a decrease in bit cell size. In 2013, a production desktop 3 TB HDD (with four platters) would have had an areal density of about 500 Gbit/in2 which would have amounted to a bit cell comprising about 18 magnetic grains (11 by 1.6 grains). Since the mid-2000s areal density progress has increasingly been challenged by a superparamagnetic trilemma involving grain size, grain magnetic strength and ability of the head to write. In order to maintain acceptable signal to noise smaller grains are required; smaller grains may self-reverse (thermal instability) unless their magnetic strength is increased, but known write head materials are unable to generate a magnetic field sufficient to write the medium. Several new magnetic storage technologies are being developed to overcome or at least abate this trilemma and thereby maintain the competitiveness of HDDs with respect to products such as flash memory-based solid-state drives (SSDs). In 2013, Seagate introduced one such technology, shingled magnetic recording (SMR). Additionally, SMR comes with design complexities that may cause reduced write performance. Other new recording technologies that, as of 2016, still remain under development include heat-assisted magnetic recording (HAMR), microwave-assisted magnetic recording (MAMR), two-dimensional magnetic recording (TDMR), bit-patterned recording (BPR), and "current perpendicular to plane" giant magnetoresistance (CPP/GMR) heads. The rate of areal density growth has dropped below the historical Moore's law rate of 40% per year, and the deceleration is expected to persist through at least 2020. Depending upon assumptions on feasibility and timing of these technologies, the median forecast by industry observers and analysts for 2020 and beyond for areal density growth is 20% per year with a range of 10–30%. The achievable limit for the HAMR technology in combination with BPR and SMR may be 10 Tbit/in2, which would be 20 times higher than the 500 Gbit/in2 represented by 2013 production desktop HDDs. As of 2015, HAMR HDDs have been delayed several years, and are expected in 2018. They require a different architecture, with redesigned media and read/write heads, new lasers, and new near-field optical transducers. The capacity of a hard disk drive, as reported by an operating system to the end user, is smaller than the amount stated by the manufacturer, which has several reasons: the operating system using some space, use of some space for data redundancy, and space use for file system structures. The difference in capacity reported in true SI-based units vs. binary prefixes can lead to a false impression of missing capacity. 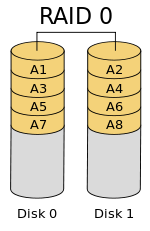 The gross capacity of older HDDs is calculated as the product of the number of cylinders per recording zone, the number of bytes per sector (most commonly 512), and the count of zones of the drive. Some modern SATA drives also report cylinder-head-sector (CHS) capacities, but these are not physical parameters because the reported values are constrained by historic operating system interfaces. The C/H/S scheme has been replaced by logical block addressing (LBA), a simple linear addressing scheme that locates blocks by an integer index, which starts at LBA 0 for the first block and increments thereafter. When using the C/H/S method to describe modern large drives, the number of heads is often set to 64, although a typical hard disk drive, as of 2013, has between one and four platters. The presentation of a hard disk drive to its host is determined by the disk controller. The actual presentation may differ substantially from the drive's native interface, particularly in mainframes or servers. Modern HDDs, such as SAS and SATA drives, appear at their interfaces as a contiguous set of logical blocks that are typically 512 bytes long, though the industry is in the process of changing to the 4,096-byte logical blocks layout, known as the Advanced Format (AF). The process of initializing these logical blocks on the physical disk platters is called low-level formatting, which is usually performed at the factory and is not normally changed in the field. [lower-alpha 8] As a next step in preparing an HDD for use, high-level formatting writes partition and file system structures into selected logical blocks to make the remaining logical blocks available to the host's operating system and its applications. The file system uses some of the disk space to structure the HDD and organize files, recording their file names and the sequence of disk areas that represent the file. Examples of data structures stored on disk to retrieve files include the File Allocation Table (FAT) in the DOS file system and inodes in many UNIX file systems, as well as other operating system data structures (also known as metadata). As a consequence, not all the space on an HDD is available for user files, but this system overhead is usually negligible. The total capacity of HDDs is given by manufacturers in SI-based units[lower-alpha 11] such as gigabytes (1 GB = 1,000,000,000 bytes) and terabytes (1 TB = 1,000,000,000,000 bytes). The practice of using SI-based prefixes (denoting powers of 1,000) in the hard disk drive and computer industries dates back to the early days of computing; by the 1970s, "million", "mega" and "M" were consistently used in the decimal sense for drive capacity. However, capacities of memory (RAM, ROM) and CDs are traditionally quoted using a binary interpretation of the prefixes, i.e. using powers of 1024 instead of 1000. Internally, computers do not represent either hard disk drive or memory capacity in powers of 1,024, but reporting it in this manner is a convention. The Microsoft Windows family of operating systems uses the binary convention when reporting storage capacity, so an HDD offered by its manufacturer as a 1 TB drive is reported by these operating systems as a 931 GB HDD. OS X 10.6 ("Snow Leopard") uses decimal convention when reporting HDD capacity. The default behavior of the df command-line utility on Linux is to report the HDD capacity as a number of 1024-byte units. 8-inch Obsolete 362 mm 241.3 mm 117.5 mm ? ? ? IBM's first hard drive, the IBM 350, used a stack of fifty 24-inch platters and was of a size comparable to two large refrigerators. In 1962, IBM introduced its model 1311 disk, which used six 14-inch (nominal size) platters in a removable pack and was roughly the size of a washing machine. This became a standard platter size and drive form-factor for many years, used also by other manufacturers. The IBM 2314 used platters of the same size in an eleven-high pack and introduced the "drive in a drawer" layout, although the "drawer" was not the complete drive. Later drives were designed to fit entirely into a chassis that would mount in a 19-inch rack. Digital's RK05 and RL01 were early examples using single 14-inch platters in removable packs, the entire drive fitting in a 10.5-inch-high rack space (six rack units). In the mid-to-late 1980s the similarly sized Fujitsu Eagle, which used (coincidentally) 10.5-inch platters, was a popular product. Such large platters were never used with microprocessor-based systems. With increasing sales of microcomputers having built in floppy-disk drives (FDDs), HDDs that would fit to the FDD mountings became desirable. Thus HDD Form factors, initially followed those of 8-inch, 5.25-inch, and 3.5-inch floppy disk drives. Because there were no smaller floppy disk drives, smaller HDD form factors developed from product offerings or industry standards. 6999241300000000000♠9.5 in × 6999117449599999999♠4.624 in × 6999361950000000000♠14.25 in (6999241300000000000♠241.3 mm × 6999117500000000000♠117.5 mm × 6999362000000000000♠362 mm). In 1979, Shugart Associates' SA1000 was the first form factor compatible HDD, having the same dimensions and a compatible interface to the 8" FDD. 5.75 in × 3.25 in × 8 in (146.1 mm × 82.55 mm × 203 mm). This smaller form factor, first used in an HDD by Seagate in 1980, was the same size as full-height 5 1⁄4-inch-diameter (130 mm) FDD, 3.25-inches high. This is twice as high as "half height"; i.e., 1.63 in (41.4 mm). Most desktop models of drives for optical 120 mm disks (DVD, CD) use the half height 5¼" dimension, but it fell out of fashion for HDDs. The format was standardized as EIA-741 and co-published as SFF-8501 for disk drives, with other SFF-85xx series standards covering related 5.25 inch devices (optical drives, etc.) The Quantum Bigfoot HDD was the last to use it in the late 1990s, with "low-profile" (≈25 mm) and "ultra-low-profile" (≈20 mm) high versions. 4 in × 1 in × 5.75 in (101.6 mm × 25.4 mm × 146 mm) = 376.77344 cm³. This smaller form factor is similar to that used in an HDD by Rodime in 1983, which was the same size as the "half height" 3½" FDD, i.e., 1.63 inches high. Today, the 1-inch high ("slimline" or "low-profile") version of this form factor is the most popular form used in most desktops. The format was standardized in terms of dimensions and positions of mounting holes as EIA/ECA-740, co-published as SFF-8301. 6998698500000000000♠2.75 in × 0.275–6998190499999999999♠0.75 in × 6999100202999999999♠3.945 in (6998698500000000000♠69.85 mm × 7–6998190000000000000♠19 mm × 6999100000000000000♠100 mm) = 48.895–6996132715000000000♠132.715 cm3. This smaller form factor was introduced by PrairieTek in 1988; there is no corresponding FDD. The 2.5-inch drive format is standardized in the EIA/ECA-720 co-published as SFF-8201; when used with specific connectors, more detailed specifications are SFF-8212 for the 50-pin (ATA laptop) connector, SFF-8223 with the SATA, or SAS connector and SFF-8222 with the SCA-2 connector. 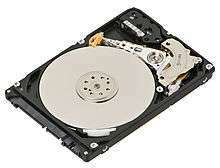 It came to be widely used for HDDs in mobile devices (laptops, music players, etc.) and for solid-state drives (SSDs), by 2008 replacing some 3.5 inch enterprise-class drives. It is also used in the PlayStation 3 and Xbox 360 video game consoles. Drives 9.5 mm high became an unofficial standard for all except the largest-capacity laptop drives (usually having two platters inside); 12.5 mm-high drives, typically with three platters, are used for maximum capacity, but will not fit most laptop computers. Enterprise-class drives can have a height up to 15 mm. Seagate released a 7 mm drive aimed at entry level laptops and high end netbooks in December 2009. Western Digital released on April 23, 2013 a hard drive 5 mm in height specifically aimed at UltraBooks. 54 mm × 8 mm × 78.5 mm[lower-alpha 14] = 33.912 cm³. This form factor, originally introduced by Integral Peripherals in 1993, evolved into the ATA-7 LIF with dimensions as stated. For a time it was increasingly used in digital audio players and subnotebooks, but its popularity decreased to the point where this form factor is increasingly rare and only a small percentage of the overall market. There was an attempt to standardize this format as SFF-8123, but it was cancelled in 2005. SATA revision 2.6 standardized the internal Micro SATA connector and device dimensions. 42.8 mm × 5 mm × 36.4 mm. This form factor was introduced in 1999, as IBM's Microdrive to fit inside a CF Type II slot. Samsung calls the same form factor "1.3 inch" drive in its product literature. 24 mm × 5 mm × 32 mm. Toshiba announced this form factor in January 2004 for use in mobile phones and similar applications, including SD/MMC slot compatible HDDs optimized for video storage on 4G handsets. Toshiba manufactured a 4 GB (MK4001MTD) and an 8 GB (MK8003MTD) version and holds the Guinness World Record for the smallest HDD. As of 2012, 2.5-inch and 3.5-inch hard disks were the most popular sizes. By 2009, all manufacturers had discontinued the development of new products for the 1.3-inch, 1-inch and 0.85-inch form factors due to falling prices of flash memory, which has no moving parts. While these sizes are customarily described by an approximately correct figure in inches, actual sizes have long been specified in millimeters. The factors that limit the time to access the data on an HDD are mostly related to the mechanical nature of the rotating disks and moving heads. Seek time is a measure of how long it takes the head assembly to travel to the track of the disk that contains data. Rotational latency is incurred because the desired disk sector may not be directly under the head when data transfer is requested. These two delays are on the order of milliseconds each. The bit rate or data transfer rate (once the head is in the right position) creates delay which is a function of the number of blocks transferred; typically relatively small, but can be quite long with the transfer of large contiguous files. Delay may also occur if the drive disks are stopped to save energy. An HDD's Average Access Time is its average seek time which technically is the time to do all possible seeks divided by the number of all possible seeks, but in practice is determined by statistical methods or simply approximated as the time of a seek over one-third of the number of tracks. Average seek time ranges from under 4 ms for high-end server drives to 15 ms for mobile drives, with the most common mobile drives at about 12 ms and the most common desktop type typically being around 9 ms. The first HDD had an average seek time of about 600 ms; by the middle of 1970s, HDDs were available with seek times of about 25 ms. Some early PC drives used a stepper motor to move the heads, and as a result had seek times as slow as 80–120 ms, but this was quickly improved by voice coil type actuation in the 1980s, reducing seek times to around 20 ms. Seek time has continued to improve slowly over time. Some desktop and laptop computer systems allow the user to make a tradeoff between seek performance and drive noise. Faster seek rates typically require more energy usage to quickly move the heads across the platter, causing louder noises from the pivot bearing and greater device vibrations as the heads are rapidly accelerated during the start of the seek motion and decelerated at the end of the seek motion. Quiet operation reduces movement speed and acceleration rates, but at a cost of reduced seek performance. As of 2010, a typical 7,200-rpm desktop HDD has a sustained "disk-to-buffer" data transfer rate up to 1,030 Mbit/s. This rate depends on the track location; the rate is higher for data on the outer tracks (where there are more data sectors per rotation) and lower toward the inner tracks (where there are fewer data sectors per rotation); and is generally somewhat higher for 10,000-rpm drives. A current widely used standard for the "buffer-to-computer" interface is 3.0 Gbit/s SATA, which can send about 300 megabyte/s (10-bit encoding) from the buffer to the computer, and thus is still comfortably ahead of today's disk-to-buffer transfer rates. Data transfer rate (read/write) can be measured by writing a large file to disk using special file generator tools, then reading back the file. Transfer rate can be influenced by file system fragmentation and the layout of the files. HDDs are accessed over one of a number of bus types, including as of 2011 parallel ATA (PATA, also called IDE or EIDE; described before the introduction of SATA as ATA), Serial ATA (SATA), SCSI, Serial Attached SCSI (SAS), and Fibre Channel. Bridge circuitry is sometimes used to connect HDDs to buses with which they cannot communicate natively, such as IEEE 1394, USB and SCSI. Modern HDDs present a consistent interface to the rest of the computer, no matter what data encoding scheme is used internally. Typically a DSP in the electronics inside the HDD takes the raw analog voltages from the read head and uses PRML and Reed–Solomon error correction to decode the sector boundaries and sector data, then sends that data out the standard interface. That DSP also watches the error rate detected by error detection and correction, and performs bad sector remapping, data collection for Self-Monitoring, Analysis, and Reporting Technology, and other internal tasks. Modern interfaces connect an HDD to a host bus interface adapter (today typically integrated into the "south bridge") with one data/control cable. Each drive also has an additional power cable, usually direct to the power supply unit. Small Computer System Interface (SCSI), originally named SASI for Shugart Associates System Interface, was standard on servers, workstations, Commodore Amiga, Atari ST and Apple Macintosh computers through the mid-1990s, by which time most models had been transitioned to IDE (and later, SATA) family disks. The range limitations of the data cable allows for external SCSI devices. Integrated Drive Electronics (IDE), later standardized under the name AT Attachment (ATA, with the alias P-ATA or PATA (Parallel ATA) retroactively added upon introduction of SATA) moved the HDD controller from the interface card to the disk drive. This helped to standardize the host/controller interface, reduce the programming complexity in the host device driver, and reduced system cost and complexity. The 40-pin IDE/ATA connection transfers 16 bits of data at a time on the data cable. The data cable was originally 40-conductor, but later higher speed requirements for data transfer to and from the HDD led to an "ultra DMA" mode, known as UDMA. Progressively swifter versions of this standard ultimately added the requirement for an 80-conductor variant of the same cable, where half of the conductors provides grounding necessary for enhanced high-speed signal quality by reducing cross talk. Due to the extremely close spacing between the heads and the disk surface, HDDs are vulnerable to being damaged by a head crash—a failure of the disk in which the head scrapes across the platter surface, often grinding away the thin magnetic film and causing data loss. Head crashes can be caused by electronic failure, a sudden power failure, physical shock, contamination of the drive's internal enclosure, wear and tear, corrosion, or poorly manufactured platters and heads. The HDD's spindle system relies on air density inside the disk enclosure to support the heads at their proper flying height while the disk rotates. HDDs require a certain range of air densities in order to operate properly. The connection to the external environment and density occurs through a small hole in the enclosure (about 0.5 mm in breadth), usually with a filter on the inside (the breather filter). If the air density is too low, then there is not enough lift for the flying head, so the head gets too close to the disk, and there is a risk of head crashes and data loss. Specially manufactured sealed and pressurized disks are needed for reliable high-altitude operation, above about 3,000 m (9,800 ft). Modern disks include temperature sensors and adjust their operation to the operating environment. Breather holes can be seen on all disk drives—they usually have a sticker next to them, warning the user not to cover the holes. The air inside the operating drive is constantly moving too, being swept in motion by friction with the spinning platters. This air passes through an internal recirculation (or "recirc") filter to remove any leftover contaminants from manufacture, any particles or chemicals that may have somehow entered the enclosure, and any particles or outgassing generated internally in normal operation. Very high humidity present for extended periods of time can corrode the heads and platters. They typically store between 60 GB and 4 TB and rotate at 5,400 to 10,000 rpm, and have a media transfer rate of 0.5 Gbit/s or higher (1 GB = 109 bytes; 1 Gbit/s = 109 bit/s). In August 2014, the highest-capacity desktop HDDs stored 8 TB, which increased to 10 TB by June 2016. As of 2016, the typical speed of a hard drive in an average desktop computer is 7200 RPM, whereas low-cost desktop computers may use 5900 RPM or 5400 RPM drives. For some time in the 2000s and early 2010s some desktop users would also use 10k RPM drives such as Western Digital Raptor but such drives have become much rarer as of 2016 and are not commonly used now, having been replaced by NAND flash-based SSDs. Smaller than their desktop and enterprise counterparts, they tend to be slower and have lower capacity. Mobile HDDs spin at 4,200 rpm, 5,200 rpm, 5,400 rpm, or 7,200 rpm, with 5,400 rpm being typical. 7,200 rpm drives tend to be more expensive and have smaller capacities, while 4,200 rpm models usually have very high storage capacities. Because of smaller platter(s), mobile HDDs generally have lower capacity than their greater desktop counterparts. More than 200 companies have manufactured HDDs over time. But consolidations have concentrated production into just three manufacturers today: Western Digital, Seagate, and Toshiba. Worldwide revenues for disk storage were $28 billion in 2015, down from $32 billion in 2013. Worldwide shipments were 469 million units in 2015, down 17% from 564 million in 2014 and 551 million in 2013. Market shares are 40–45% each for Seagate and Western Digital and 13–17% for Toshiba. The two largest manufacturers had an average sales price of USD $60 per HDD unit in 2015. The maximum areal storage density for flash memory used in SSDs is 2.8 Tbit/in2 in laboratory demonstrations as of 2016, and the maximum for HDDs is 1.5 Tbit/in2. The areal density of flash memory is doubling every two years, similar to Moore's law (40% per year) and faster than the 10–20% per year for HDDs. As of 2016, maximum capacity was 10 terabytes for an HDD, and 15 terabytes for an SSD. HDDs were used in 70% of the desktop and notebook computers produced in 2016, and SSDs were used in 30%. The usage share of HDDs is declining and could drop below 50% in 2018–2019 according to one forecast, because SSDs are replacing smaller-capacity (less than one-terabyte) HDDs in desktop and notebook computers and MP3 players. 3.0 TB 3.5" Seagate FreeAgent GoFlex plug and play external USB 3.0-compatible drive (left), 750 GB 3.5" Seagate Technology push-button external USB 2.0 drive (right), and a 500 GB 2.5" generic brand plug and play external USB 2.0 drive (front). 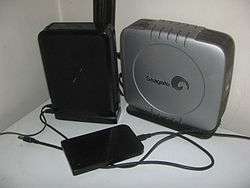 External hard disk drives[lower-alpha 17] typically connect via USB; variants using USB 2.0 interface generally have slower data transfer rates when compared to internally mounted hard drives connected through SATA. Plug and play drive functionality offers system compatibility and features large storage options and portable design. As of March 2015, available capacities for external hard disk drives ranged from 500 GB to 8 TB. 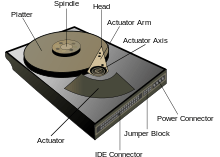 Hard disk drives are traditionally symbolized as a stylized stack of platters or as a cylinder, and are as such found in various diagrams; sometimes, they are depicted with small lights to indicate data access. In most modern graphical user environments (GUIs), hard disk drives are represented by an illustration or photograph of the drive enclosure. ↑ Further inequivalent terms used to describe various hard disk drives include disk drive, disk file, direct access storage device (DASD), CKD disk, and Winchester disk drive (after the IBM 3340). The term "DASD" includes other devices beside disks. ↑ Comparable in size to a large side-by-side refrigerator. ↑ The 1.8-inch form factor is obsolete; sizes smaller than 2.5 inches have been replaced by flash memory. ↑ Initially gamma iron oxide particles in an epoxy binder, the recording layer in a modern HDD typically is domains of a granular Cobalt-Chrome-Platinum-based alloy physically isolated by an oxide to enable perpendicular recording. ↑ Historically a variety of run-length limited codes have been used in magnetic recording including for example, codes named FM, MFM and GCR which are no longer used in modern HDDs. ↑ However, some enterprise SAS drives have other block sizes such as 520, 524 and 528 bytes, which can be changed in the field. 1 2 Expressed using decimal multiples. 1 2 Expressed using binary multiples. ↑ The International System of Units (SI), formerly known as the "metric system", does not define units for digital information but notes that the SI-defined prefixes (such as kilo, mega, etc.) may be applied outside the contexts where SI-defined base units or derived units would be used. ↑ Five platters for a conventional hard disk drive, and seven platters for a hard disk drive filled with Helium. 1 2 This dimension includes a 0.5 mm protrusion of the Micro SATA connector from the device body. ↑ The Quantum Bigfoot TS used a maximum of three platters, other earlier and lower capacity product used up to four platters in a 5.25-inch HH form factor, e.g., Microscience HH1090 circa 1989. ↑ These differ from removable disk media, e.g., disk packs or data modules, in that they include, for example, actuators, drive electronics, motors. ↑ Arpaci-Dusseau, Remzi H.; Arpaci-Dusseau, Andrea C. (2014). "Operating Systems: Three Easy Pieces, Chapter: Hard Disk Drives" (PDF). Arpaci-Dusseau Books. 1 2 3 4 5 6 "IBM Archives: IBM 350 disk storage unit". Retrieved 2012-10-19. ↑ "Validating the Reliability of Intel Solid-State Drives" (PDF). Intel. July 2011. Retrieved 10 February 2012. ↑ Fullerton, Eric (March 2014). "5th Non-Volatile Memories Workshop (NVMW 2014)" (PDF). IEEE. Retrieved April 23, 2014. ↑ Handy, James (July 31, 2012). "For the Lack of a Fab...". Objective Analysis. Retrieved November 25, 2012. 1 2 Hutchinson, Lee. (2012-06-25) How SSDs conquered mobile devices and modern OSes. Ars Technica. Retrieved on 2013-01-07. 1 2 Santo Domingo, Joel (May 10, 2012). "SSD vs HDD: What's the Difference?". PC Magazine. Retrieved November 24, 2012. 1 2 Lucas Mearian (2 December 2015). "WD ships world's first 10TB helium-filled hard drive". Computerworld. Retrieved 13 February 2016. 1 2 3 "Toshiba Storage Solutions – MK3233GSG". ↑ Ballistic Research Laboratories "A THIRD SURVEY OF DOMESTIC ELECTRONIC DIGITAL COMPUTING SYSTEMS," March 1961, section on IBM 305 RAMAC (p. 314-331) states a $34,500 purchase price which calculates to $9,200/MB. 1 2 John C. McCallum (2015-05-16). "Disk Drive Prices (1955–2015)". jcmit.com. Archived from the original on 2015-07-14. Retrieved 2015-07-25. ↑ "Magnetic head development". IBM Archives. Retrieved August 11, 2014. 1 2 Coughlin, Tom (February 3, 2016). "Flash Memory Areal Densities Exceed Those of Hard Drives". forbes.com. Retrieved July 4, 2016. 1 2 "IBM Archives: IBM 350 disk storage unit". IBM. Retrieved July 26, 2015. ↑ "IBM Archives: IBM 1301 disk storage unit". ibm.com. ↑ "Farming hard drives: how Backblaze weathered the Thailand drive crisis". blaze.com. 2013. Retrieved 2014-05-23. ↑ "Hard Drives". escotal.com. Retrieved 16 July 2011. ↑ "What is a "head-crash" & how can it result in permanent loss of my hard drive data?". data-master.com. Retrieved 16 July 2011. ↑ "Hard Drive Help". hardrivehelp.com. Retrieved 16 July 2011. ↑ Elert, Glenn. "Thickness of a Piece of Paper". hypertextbook.com. Retrieved 9 July 2011. ↑ CMOS-MagView is an instrument that visualizes magnetic field structures and strengths. ↑ Blount, Walker C. (November 2007). "Why 7,200 RPM Mobile Hard Disk Drives?" (PDF). Archived from the original (PDF) on 2012-04-19. Retrieved 17 July 2011. ↑ "Ref — Hard Disk Spindle Motor". PC Guide. Retrieved 2013-01-07. ↑ "Choosing High Performance Storage is not about RPM any more". Seagate. Retrieved July 25, 2015. ↑ Hayes, Brian. "Terabyte Territory". American Scientist. p. 212. ↑ "Press Releases December 14, 2004". Toshiba. Retrieved 13 March 2009. ↑ "Seagate Momentus 2½" HDDs per webpage January 2008". Seagate.com. 24 October 2008. Retrieved 13 March 2009. ↑ "Seagate Barracuda 3½" HDDs per webpage January 2008". Seagate.com. Retrieved 13 March 2009. ↑ "Western Digital Scorpio 2½" and Greenpower 3½" HDDs per quarterly conference, July 2007". Wdc.com. Retrieved 13 March 2009. ↑ "Exchange spring recording media for areal densities up to 10Tbit/in2, J. Magn. Mag. Mat., D. Suess et al, 2004 online". ↑ "Composite media for perpendicular magnetic recording, IEEE Trans. Mag. Mat., R. Victora et al, 2005". ↑ Curtis E. Stevens (2011). "Advanced Format in Legacy Infrastructures: More Transparent than Disruptive" (PDF). idema.org. Retrieved 2013-11-05. ↑ MjM Data Recovery Ltd. "MJM Data Recovery Ltd: Hard Disk Bad Sector Mapping Techniques". Datarecovery.mjm.co.uk. Archived from the original on 2014-02-01. Retrieved 2014-01-21. ↑ Charles M. Kozierok. "The PC Guide: Hard Disk: Sector Format and Structure". 1997–2004. ↑ "Enterprise Performance 15K HDD: Data Sheet" (PDF). Seagate. 2013. Retrieved 2013-10-24. ↑ "WD Xe: Datacenter hard drives" (PDF). Western Digital. 2013. Retrieved 2013-10-24. ↑ "WD Re: Datacenter Capacity HDD" (PDF). Western Digital. 2013. Retrieved 2013-11-14. ↑ "Cheetah 10K.7 FC Product Manual" (PDF). Seagate. August 5, 2005. Archived from the original (PDF) on June 12, 2009. Retrieved August 29, 2013. ↑ David S. H. Rosenthal (October 1, 2010). "Keeping Bits Safe: How Hard Can It Be?". ACM Queue. Retrieved 2014-01-02. 1 2 3 4 Byrne, David (2015-07-01). "Prices for Data Storage Equipment and the State of IT Innovation". The Federal Reserve Board FEDS Notes. p. Table 2. Retrieved 2015-07-05. ↑ "Gallium Arsenide". PC Magazine. March 25, 1997. Retrieved August 16, 2014. Gordon Moore: ... the ability of the magnetic disk people to continue to increase the density is flabbergasting--that has moved at least as fast as the semiconductor complexity. ↑ Dubash, Manek (2005-04-13). "Moore's Law is dead, says Gordon Moore". techworld.com. Archived from the original on 2014-07-06. Retrieved 2014-08-17. It can't continue forever. The nature of exponentials is that you push them out and eventually disaster happens. 1 2 Mellor, Chris (2014-11-10). "Kryder's law craps out: Race to UBER-CHEAP STORAGE is OVER". theregister.co.uk. UK: The Register. Retrieved 2014-11-12. The 2011 Thai floods almost doubled disk capacity cost/GB for a while. Rosenthal writes: "The technical difficulties of migrating from PMR to HAMR, meant that already in 2010 the Kryder rate had slowed significantly and was not expected to return to its trend in the near future. The floods reinforced this." ↑ Plumer et. al, Martin L. (March 2011). "New Paradigms in Magnetic Recording" (PDF). Physics in Canada. 67 (1): 25–29. Retrieved 17 July 2014. ↑ Jake Edge (2014-03-26). "Support for shingled magnetic recording devices". LWN.net. Retrieved 2015-01-07. ↑ Jonathan Corbet (2013-04-23). "LSFMM: A storage technology update". LWN.net. Retrieved 2015-01-07. A 'shingled magnetic recording' (SMR) drive is a rotating drive that packs its tracks so closely that one track cannot be overwritten without destroying the neighboring tracks as well. The result is that overwriting data requires rewriting the entire set of closely-spaced tracks; that is an expensive tradeoff, but the benefit—​​much higher storage density—​​is deemed to be worth the cost in some situations. ↑ "Xyratex no-go for bit-patterned media". The Register. 24 April 2010. Retrieved 21 August 2010. ↑ "Report: TDK Technology "More Than Doubles" Capacity Of HDDs". Retrieved 4 October 2011. ↑ Mallary et. al, Mike (July 2014). "Head and Media Challenges for 3 Tb/in2 Microwave-Assisted Magnetic Recording". IEEE TransMag. IEEE. 50 (7): 3001008. ↑ Li, Shaojing; Livshitz, Boris; Bertram, H. Neal; Schabes, Manfred; Schrefl, Thomas; Fullerton, Eric E.; Lomakin, Vitaliy (2009). "Microwave assisted magnetization reversal in composite media" (PDF). Applied Physics Letters. 94 (20): 202509. doi:10.1063/1.3133354. ↑ Wood, Roger (2010-10-19). "Shingled Magnetic Recording and Two-Dimensional Magnetic Recording" (PDF). ewh.ieee.org. Hitachi GST. Retrieved 2014-08-04. ↑ "Will Toshiba's Bit-Patterned Drives Change the HDD Landscape?". PC Magazine. 19 August 2010. Retrieved 21 August 2010. ↑ Coughlin, Thomas; Grochowski, Edward (19 June 2012). "Years of Destiny: HDD Capital Spending and Technology Developments from 2012–2016" (PDF). IEEE Santa Clara Valley Magnetics Society. Retrieved 9 October 2012. 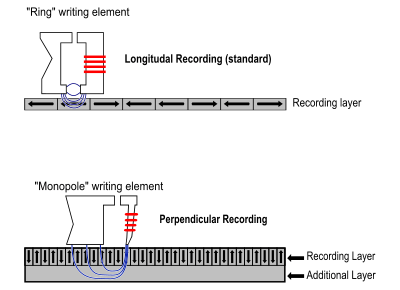 ↑ "Perpendicular Magnetic Recording Explained - Animation". ↑ Raymond, Robert M. (2013-09-09). "Current and Emerging Storage Technologies iCAS2013" (PDF). In Mahoney III, William P. Storage Technologies Areal Density Trends. International Computing for the Atmospheric Sciences Symposium (iCAS2013). Annecy, France: ORACLE Corp. at National Center for Atmospheric Research under sponsorship from the U.S. National Science Foundation. page 11: Areal Density (Gbits/in^2) HDD Products 2010–2022 10-20%/year? ↑ Kaur, Simran (2014-09-15). "Seagate treads safely in uncertain demand environment; narrow moat has negative trend.". Morningstar. Retrieved 2014-09-26. a slowing areal density curve … that slowed around 2010 and will advance areal density 25% annually till 2020. ↑ Christoph Vogler; Claas Abert; Florian Bruckner; Dieter Suess; Dirk Praetorius (2015-12-14). "Areal density optimizations for heat-assisted-magnetic recording of high density bit-patterned media". arXiv:1512.03690 . ↑ Anton Shilov (2015-12-18). "Hard Disk Drives with HAMR Technology Set to Arrive in 2018". Retrieved 2016-01-02. Unfortunately, mass production of actual hard drives featuring HAMR has been delayed for a number of times already and now it turns out that the first HAMR-based HDDs are due in 2018. ... HAMR HDDs will feature a new architecture, require new media, completely redesigned read/write heads with a laser as well as a special near-field optical transducer (NFT) and a number of other components not used or mass produced today. 1 2 Information technology – Serial Attached SCSI – 2 (SAS-2), INCITS 457 Draft 2, 8 May 2009, chapter 4.1 Direct-access block device type model overview, The LBAs on a logical unit shall begin with zero and shall be contiguous up to the last logical block on the logical unit. ↑ "LBA Count for Disk Drives Standard (Document LBA1-03)" (PDF). IDEMA. 2009-06-15. Retrieved 2016-02-14. ↑ "How to Measure Storage Efficiency – Part II – Taxes". Blogs.netapp.com. 14 August 2009. Archived from the original on 2011-07-20. Retrieved 26 April 2012. ↑ "Western Digital's Advanced Format: The 4K Sector Transition Begins". Anandtech.com. Retrieved 26 April 2012. ↑ "High-Level Formatting". Pcguide.com. 17 April 2001. Retrieved 26 April 2012. 1 2 "Storage Solutions Guide" (PDF). Seagate. October 2012. Archived from the original (PDF) on 2013-06-20. Retrieved June 8, 2013. ↑ "MKxx33GSG MK1235GSL r1" (PDF). Toshiba. Retrieved 2013-01-07. ↑ "Drive displays a smaller capacity than the indicated size on the drive label". Wdc.custhelp.com. 29 March 2012. Retrieved 26 April 2012. ↑ "HGST" (PDF). Retrieved 2013-06-08. ↑ "Samsung". Samsung Hard Drives. Retrieved 2013-06-08. ↑ "Toshiba" (PDF). Retrieved 2013-06-08. ↑ "Western Digital" (PDF). Wdc.com. Retrieved 2013-06-08. ↑ Introduction to IBM Direct Access Storage Devices, M. Bohl, IBM publication SR20-4738. 1981. 1 2 Apple Support Team. "How OS X and iOS report storage capacity". Apple, Inc.
↑ "df(1) – Linux man page". linux.die.net. Retrieved 2015-07-18. ↑ "Western Digital Settles Hard-Drive Capacity Lawsuit, Associated Press 28 June 2006 retrieved 25 November 2010". Fox News. 22 March 2001. Retrieved 26 April 2012. ↑ Published on 26 October 2007 by Phil Cogar (26 October 2007). "Seagate lawsuit concludes, settlement announced". Bit-tech.net. Retrieved 26 April 2012. ↑ "Western Digital – Notice of Class Action Settlement email". Xtremesystems.org. Retrieved 26 April 2012. ↑ "Western Digital Corporation Is Now Shipping World's First Helium-filled 10TB PMR HDD To Meet Exponential Growth In Data". 2015. Retrieved December 7, 2015. ↑ "Ultrastar He6: 6TB 3.5-inch Helium Platform Enterprise Hard Drive". hgst.com. 2013. Retrieved 2013-12-06. ↑ "8TB HDD Now Shipping ...". 2014. Retrieved October 13, 2014. ↑ "Western Digital builds 5mm-thick hybrid hard drive, Ultrabook makers sign on early". Engadget. Retrieved 2013-01-07. ↑ "Quantum Go*Drive specifications". 4drives.com. Retrieved 2014-05-22. ↑ "Samsung HDD Announces The Thinnest And Lightest Weight 4TB External Hard Drives In The World". June 17, 2015. Retrieved 2015-06-23. 1 2 "Seagate unveils world's first 2.5-inch 4TB HDD with 800GB platters". KitGuru. Retrieved 24 September 2015. ↑ "Toshiba MK2239GSL, 220 GB single-platter HDD" (PDF). ↑ "SDK Starts Shipments of 1.3-Inch PMR-Technology-Based HD Media". Sdk.co.jp. 10 January 2008. Archived from the original on 2009-03-16. Retrieved 13 March 2009. ↑ "Proving that 8 GB, 0.85 inch hard disk drive exists". Digitaljournal.com. 17 February 2007. Retrieved 26 April 2012. ↑ "Toshiba Enters Guinness World Records Book with the World's Smallest Hard Disk Drive". Toshiba Corp. 16 March 2004. Retrieved 11 September 2012. ↑ Christensen, Clayton M. (1997). The Innovator's Dilemma. New York, New York: HarperBusiness. pp. 19–252. ISBN 0-06-662069-4. ↑ "SFF-8500 Specification for Suite of 5.25" Form Factor Specifications" (PDF). SFF Committee. June 5, 1995. Retrieved 2014-02-01. ↑ "Winchester has 3.5-inch diameter". Electronics: 184. March 1983. ↑ "SFF-8301 Specification for Form Factor of 3.5" Disk Drives" (PDF). SFF Committee. February 8, 2013. Retrieved 2014-02-01. ↑ Chandler, Doug (26 September 1988). "Startup Ships 2.5-Inch Hard Disk Aimed for Portables, Laptops". PC Week: 6. ↑ "SFF-8201 Specification for Form Factor of 2.5" Disk Drives" (PDF). SFF Committee. October 28, 2013. Retrieved 2014-02-01. ↑ Schmid, Patrick; Achim Roos (8 May 2010). "3.5" Vs. 2.5" SAS HDDs: In Storage, Size Matters". Tomshardware.com. Retrieved 25 June 2010. ↑ "PlayStation 3 Slim Teardown". 25 August 2009. Retrieved 15 November 2010. ↑ "Xbox 360 HDD Replacement". 31 July 2010. Retrieved 9 March 2016. ↑ Schmid, Patrick; Achim Roos (22 May 2010). "9.5 Versus 12.5 mm: Which Notebook HDD Is Right For You?". Tomshardware.com. Retrieved 22 June 2010. ↑ "Seagate Unveils World's Thinnest 2.5-Inch Hard Drive For Slim Laptop Computers". physorg.com. 15 December 2009. Retrieved 15 December 2009. ↑ Ian Paul (23 April 2013). "Western Digital rolls out ultra-slim 5 mm Ultrabook drives.". PCWorld. ↑ "World HDD Market: Key Research Findings 2010" (PDF). Yano Research Institute. December 15, 2010. Retrieved October 16, 2012. ↑ "Specification for 1.8" (60x70mm) w/Serial Attachment Connector, Rev C" (PDF). SFF Committee. January 2005. Retrieved 2014-02-01. ↑ "Toshiba Storage Device Division Overview" (PDF). Retrieved 2013-06-08. 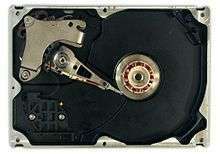 ↑ Flash price fall shakes HDD market, EETimes Asia, 1 August 2007. ↑ In 2008 Samsung introduced the 1.3-inch SpinPoint A1 HDD but by March 2009 the family was listed as End Of Life Products and new 1.3-inch models were not available in this size. ↑ "Western Digital definition of Average Access Time". Wdc.com. 1 July 2006. Retrieved 26 April 2012. 1 2 Kearns, Dave (18 April 2001). "How to defrag". ITWorld. ↑ Broida, Rick (10 April 2009). "Turning Off Disk Defragmenter May Solve a Sluggish PC". PCWorld. ↑ Anand Lal Shimpi (2010-04-06). "Western Digital's New VelociRaptor VR200M: 10K RPM at 450GB and 600GB". anandtech.com. Retrieved 2013-12-19. ↑ "WD Scorpio Blue Mobile: Drive Specifications". Western Digital. June 2010. Retrieved 15 January 2011. ↑ "IBM Archives: IBM 3350 direct access storage". IBM. Retrieved 2013-01-07. ↑ "Speed Considerations". Seagate. Archived from the original on 2011-02-10. Retrieved 22 January 2011. ↑ "Reed Solomon Codes – Introduction". Archived from the original on 8 July 2011. ↑ "Micro House PC Hardware Library Volume I: Hard Drives, Scott Mueler, Macmillan Computer Publishing". Alasir.com. Retrieved 26 April 2012. ↑ "Ruggedized Disk Drives for Commercial Airborne Computer Systems" (PDF). ↑ Grabianowski, Ed. "How To Recover Lost Data from Your Hard Drive". HowStuffWorks. pp. 5–6. Retrieved 24 October 2012. ↑ "Everything You Know About Disks Is Wrong". Storagemojo.com. 2007-02-22. Retrieved 2010-08-24. ↑ Eduardo Pinheiro; Wolf-Dietrich Weber; Luiz André Barroso (February 2007). "Failure Trends in a Large Disk Drive Population" (PDF). Google Inc. Retrieved 2011-12-26. ↑ Investigation: Is Your SSD More Reliable Than A Hard Drive? – Tom's Hardware long term SSD reliability review, 2011, "final words"
↑ Anthony, Sebastian. "Using SMART to accurately predict when a hard drive is about to die". ExtremeTech. Retrieved 25 August 2015. ↑ "Consumer hard drives as reliable as enterprise hardware". Alphr. Retrieved 25 August 2015. ↑ Beach, Brian. "Enterprise Drives: Fact or Fiction?". Backblaze. Retrieved 25 August 2015. ↑ "Seagate Ships World's First 8TB Hard Drives". US: Seagate. 2014-08-26. Archived from the original on 2014-08-27. Retrieved 2014-08-26. ↑ Broekhuijsen, Niels (2014-08-26). "Seagate 8 TB HDDs Widely Available Next Quarter, Shipping Now". Tom's Hardware. US: Purch. Retrieved 2014-08-26. 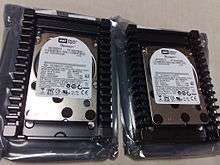 ↑ "Enterprise Capacity 3.5 Hard Drives (Helium)- Seagate". ↑ "Enterprise-class versus Desktop class Hard Drives" (PDF). Intel. Retrieved 25 September 2013. ↑ Martin K. Petersen (2008-08-30). "Linux Data Integrity" (PDF). Oracle Corporation. Archived from the original (PDF) on 2015-01-09. Retrieved 2015-01-23. Most disk drives use 512-byte sectors. [...] Enterprise drives (Parallel SCSI/SAS/FC) support 520/528 byte 'fat' sectors. ↑ Coughlin, Tom (June 7, 2016). 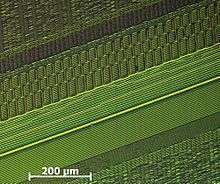 "3D NAND Enables Larger Consumer SSDs". forbes.com. Retrieved July 4, 2016. ↑ "Seagate Backup Plus External Hard Drive Review (8TB)". storagereview.com. Retrieved 20 July 2015. ↑ "Back Up Your Important Data to External Hard disk drive | Biometric Safe | Info and Products Reviews about Biometric Security Device –". Biometricsecurityproducts.org. 26 July 2011. Archived from the original on 2012-05-25. Retrieved 26 April 2012. ↑ Sebean Hsiung (2010-05-05). "How to bypass USB controller and use as a SATA drive". datarecoverytools.co.uk. Retrieved 2014-01-11. Mueller, Scott (2011). Upgrading and Repairing PCs (20th ed.). Que. ISBN 0-7897-4710-3. Messmer, Hans-Peter (2001). The Indispensable PC Hardware Book (4th ed.). Addison-Wesley. ISBN 0-201-59616-4.